ATTENTION!!! Database format will change until v1.0.0. All your existing conversations from a previous installation will not show up anymore after this update!!! Are you good at qml, C++ or encryption? Any help is appreciated. Will the project be further developed? The last version is from December 2017 and there are some gaps in functionality. Desirable would be background notification when Shmoose is closed and Omemo encryption. Yes, the development ist really slowed down. There are fixes and improvements on github. I will release a new version the next weeks. After that I will start to integrate the alpha omemo implementation as an option. But this is far from being usable on a regular basis. Currently there are only two developers on this project who are bringing in new code. So, any contributions are welcome! Please start the app from terminal. Try the sending and post the error as a ticket on github. I also would be glad about OMEMO integration. Would a donation be helpfull? OMEMO encryption would be nice. Shmoose uses the swiften library, which is not available on the device. So I had to do a statically linked binary which includes all the stuff. Hence the big file size. It's stripped, but besides that I have no idea how to additionally reduce the file size. Nice again, with a "but": /usr/bin/harbour-shnoose is quite big (85.6 Mb). As you probably know, available space in root partition is critical with current partition scheme of Xperia X. No way to reduce the size of your binary? Hi, is it possible to set Shmoose to receive notifocations about incoming messages when the app is closed? I mean for example if the default SMS app in sailfish is closed this means that it works in the background and when new SMS is received the sound and pop-up notification appears. When I use Shmoose and close it by slide a finger from top to bottom of the screen it gets completely closed and when I get a message from any contact I do not receive a notification until I log-in again. I could keep the app open (just minimize it sliding a finger from the right to the left) but it drains a battery almost twice quicker than when app is closed. Thanks in advance. Hi. Daemon mode for the app is planed for one of the next releases. But I am not sure if this has an impact on the battery life time. As far as I know, Daemon mode just hides the cover and starts the app automatically on boot up. On my device (Jolla 1) I didn't notice battery drain. I have it running all the time and got a uptime of two days on regular use. Which device are you using? I use Nexus 4. I just noticed that when the app is running the battery is discharged within less than one day. When I don't use apps like Shmoose, Whisperfish etc. it takes about 2 day before the battery is empty. But if it gives nothing (running in background) regarding a battery life it is not worth to implement it isn't it? I was sure that if the app works "in a background" uses less energy than when is up all the time... that why I asked here if it's possible. Anyway thank You for this reply schorsch. Good luck and take care! 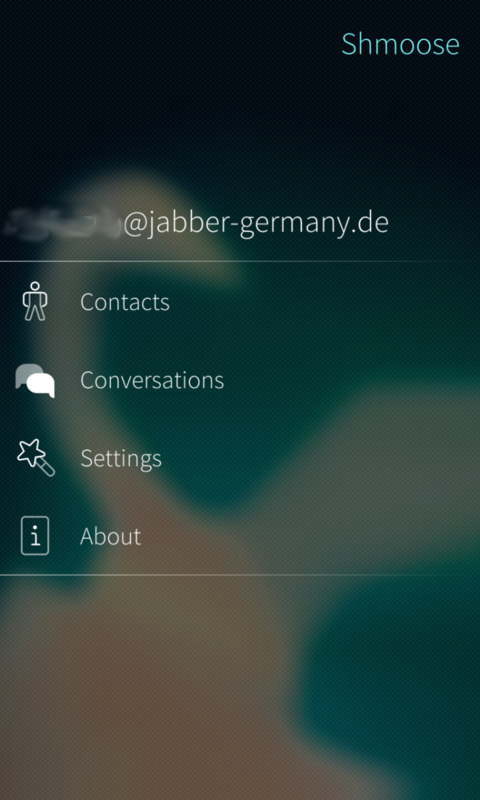 Dear Schorsch,great app on the way to a native XMPP-client but I have a question: I have an conversations.im account. Am I right that Shmoose is not able to read the archive from conversations.im? If not, would it be possible to integrate that kind of functionality because that way it would be possible to use both apps (C. and Shm) parallel before switching to Shmoose completely. Keep a stiff programmers upper lip, greetings, broncheoli. Do you mean Xep-0136 Message Archiving? You are right, shmoose does not have this feature. Personally I don't like to have my messages on a foreign server. 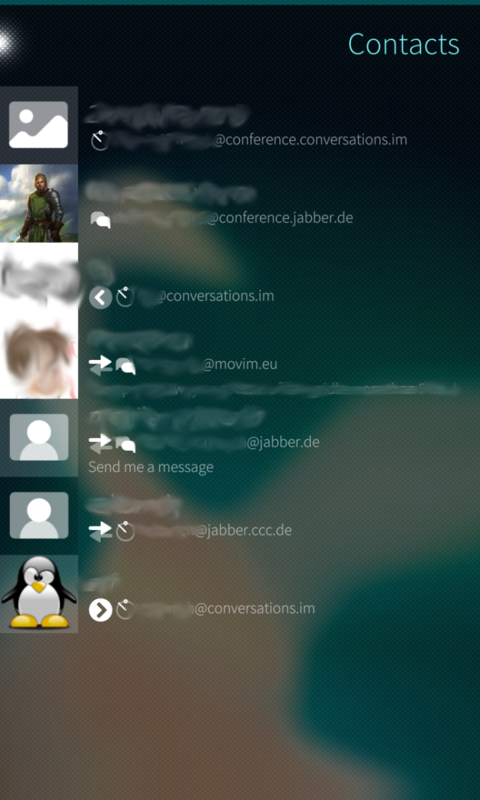 I just checked the swiften xmpp library for that feature. But unfortunatelly the library doesn't have support for that. So it isn't 'just to turn it on'. I had to implement it by myself from scratch. So this is currently out of scope for the 1.0 release. Sorry. Edit: Nice, I saw in Github that it's planned: Excellent! Great, with a "but": the app doesn't close completely. It couldn't be relaunched after exit unless I kill the process to clear RAM (using Crest for example). 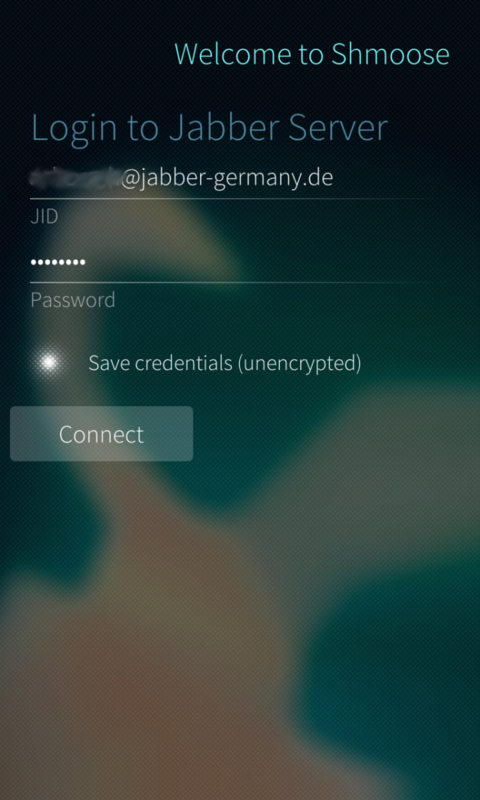 Also needed, of course: encrypted credentials. You found the first bug. That was quick ;-). Did some research. The IpHeartBeatDaemon wasn't properly terminated on app exit. Pushed a fix to github and will release a new version as soon as it's proved to work without problems.